Microsoft in partnership with Homeboyz Foundation Wednesday launched a portal for youth to access information on available job opportunities and entrepreneurship. 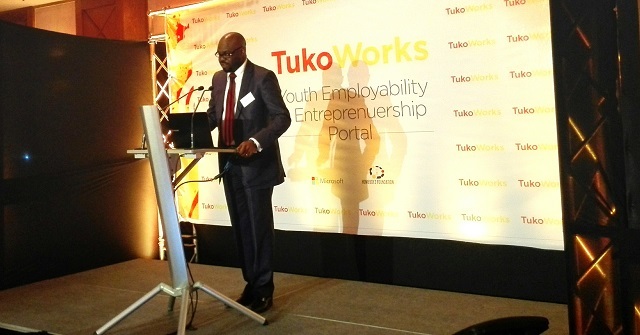 The Platform hosted on www.tukoworks.co.ke was necessitated by the need to bridge information gap for job seekers, aspiring entrepreneurs and school leavers. The youth are able to find out their employability by accessing free resources, training and career guidance off the portal. Microsoft Kenya Country Manager Kunle Awosika notes that in partnership with KEPSA (Kenya Private Sector Alliance), the portal helps youth grow their business skills. “The youth can go into the portal and get step by step guidance on how to get funding from the Youth Fund, same applies to women and the Women fund,”said Kunle. “KEPSA has decided to engage the this project because there is a problem with the job market with quite many of them being very unemployable, this leads to certain situations like the youth being used for negative political agendas,” Carole Kariuki, CEO KEPSA. 35% of Kenyan youth are unemployed with upto 56% reported to be poor by year 2009, even with them being the majority in the country, This is a problem according to Carole who adds that the youth in the job market lack skills and when one compares what the job market demands versus what skills the youth have there is quite a huge gap. To put this in perspective, out of the 1 million youth leaving college every year, half of these don’t get jobs due to skills mismatch. ● Career guidance tools: These assessments will support youth in their self-awareness to identify the skills they need to develop to be successful in their careers, and will help link them to the appropriate career advisors, training and opportunities. ● Job matching: Job, internship, and volunteer postings easily automated online, with job preparation resources on CV and cover letter writing, interviews, and workers’ rights and responsibilities. ● Extensive training options: For different skills, customized to specific target groups and jobs, and in categories such as IT skills, soft skills, entrepreneurial skills, and language skills. ● Mentoring and volunteering matching: Leveraging various alumni networks and corporate, non-corporate and individual support.